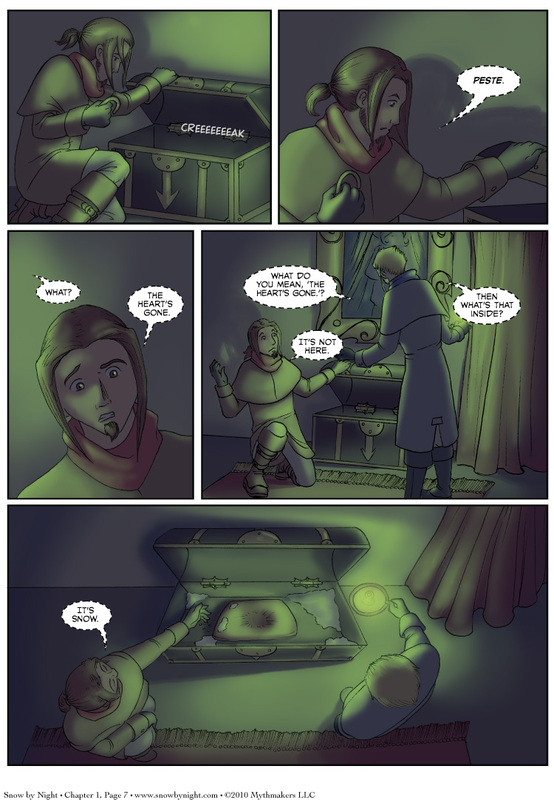 Page 7 is up and concludes the first scene. Take a look and see how the heist plays out for Blaise and Jassart. I’m very pleased with how Ricky and Brittany made my vision a reality. We seeded all sorts of details in the background. You may have noticed the painting in Dupuy’s study in page 6. That’s based on a real paining of the founding of Quebec by George Agnew Reid. Next week we head down to the lower city and one of my favorite areas in Sherbourg – Iniquity Row. It’s always a wild time on the Row. I’m sure you’ll enjoy it as well. Very intriguing beginning. I can honestly say that I am hooked. As a writer I find one of the most difficult things is to create a beginning that enchants and interests the reader. As a reader I have a short attention span and while I will give anything a chance, I am not very patient. But I like this already. I’m admiring the art and very interested in the two main characters. Already they read as having an amusing dynamic. I like their designs and I want to learn more about them. And the lock being cold and the snow inside the chest was the perfect bit of suspense.